Policy — Do I still need this medication? Is deprescribing for you? The Canadian Deprescribing Network has contacted all provincial and territorial governments to understand what policies may be in place to promote more appropriate prescribing. Several projects on medication appropriateness are being discussed with provincial governments. The Network proposes coordinated provincial strategies to rectify the issue of unnecessary prescriptions through education, public awareness and capacity-building among health care providers. 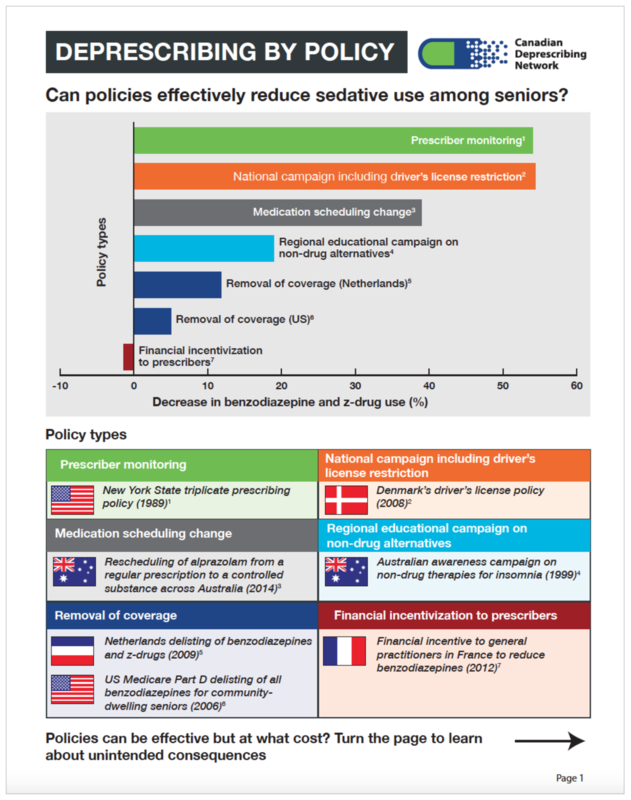 To find out what other countries are doing to address inappropriate use of sedatives, the Canadian Deprescribing Network conducted an international policy scan to pinpoint successful policies we may be able to adopt here in Canada. See the infographics below to learn more about policy types, efficacy and unintended consequences. Deprescribing by policy: Can policies effectively reduce sedative use? Deprescribing through patient education: Can patient education effectively reduce sedative use? The Canadian Deprescribing Network also looked into patient education initiatives, which helped people deprescribe sedatives around the world. See the infographics below to see the findings as well as our resources for patients.